Heading to November with a pair of new legitimate Heisman contenders and planning for playoff chaos. ** If you are a fan of a successful Group of Five program, your coach is going to get phone calls and he just might leave for another job no matter how much he loves it where he is. ** Coaches say things to keep things looking steady. Many times, those coaches leave for other jobs anyway. ** Don’t waste your time over-reacting to the initial College Football Playoff rankings on Tuesday night. They mean absolutely nothing and serve as only a practice run for the selection committee and the only real job they have at the end of the year. This is just filler content we will all overreact to anyway because we’re all a bunch of suckers. I have long been a fan of J.T. Barrett going back to his freshman season taking over Ohio State in the place of an injured Braxton Miller. All Barrett did in his first year as a starter was put the Buckeyes in position to win a Big Ten and a national title, which saw Cardale Jones step in for an injured Barrett. The following season, after the Buckeyes won it all, Urban Meyer rode with Jones as the main guy until he felt a need to return the offense to Barrett. 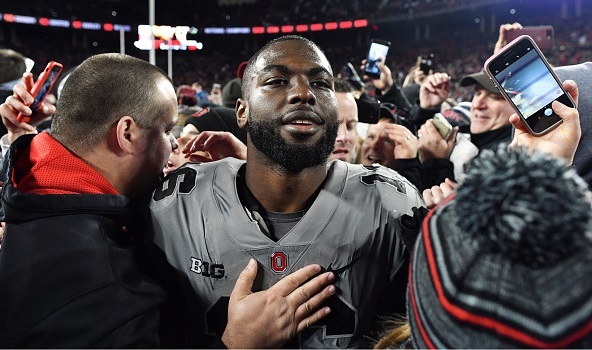 Barrett has paid his dues and given everything he can to the Ohio State program, yet he lacked what many deemed to be a big win with no Big Ten championship of his own and his trip to the College Football Playoff resulting in zero points last season. The 2017 season got off to a bumpy start too with a home loss to Oklahoma, where Baker Mayfield came in and was the star of the day on Barrett’s home field. Barrett has had his critics, some more fair than others, but he has always remained a steady face of the Ohio State offense and was always one that carried himself in a classy way through good times and bad for him and the Buckeyes. On Saturday, he silenced any critics that he may still have with a near-flawless performance against Penn State to move the Buckeyes to the top of the Big Ten East Division and firmly in place for a Big Ten title run that likely leads to a spot in the College Football Playoff. Penn State running back Saquon Barkley has been the frontrunner in the Heisman Trophy race for a while now and he may still be the betting favorite by the experts. On Saturday, he had his early Heisman moment by returning the game’s opening kick for a touchdown, and his 36-yard touchdown run later in the first half to extend Penn State’s lead would end up being the lone offensive highlight he had on the day. Barkley’s Heisman moments came at the right time, though, if Penn State could hold on to win the game. Barrett’s Heisman moment occurred for the entire afternoon with 33-of-39 for 328 yards and four touchdowns and a game-high 95 rushing yards. And he did all of that against a solid defensive team all day long. And a few of those incompletions were dropped passes. It was simply a performance for the ages, and there are few players worthy of such a moment as Barrett. I don’t know if Barrett is now the Heisman frontrunner, but he certainly should be heading to New York as a Heisman Trophy candidate along with Barkley, Notre Dame’s Josh Adams, Stanford’s Bryce Love, and Oklahoma’s Baker Mayfield. Plus, this dude is just having fun out there. There really is nothing bad to say about Barrett. He is among the best college football has to offer and his legacy at Ohio State should reflect that regardless of how this season plays out. A second SEC football coach has been sent to unemployment this season. Jim McElwain joined former Ole Miss head coach Hugh Freeze in that undesirable company on Sunday as Florida announced they had agreed to mutually part ways, but we’ll call it what it is and say McElwain was fired. Considering this was a program that played in back-to-back SEC Championship Games, the removal of McElwain after such a relatively short period of time is fascinating. But it appears that McElwain did himself no favors by mentioning he had received death threats amid Florida’s struggles, yet provided no evidence to university officials asking about the claims in hopes of helping out. Once McElwain failed to provide that evidence, and after Georgia smoked Florida 42-7 in Jacksonville, there was no turning back for the Gators. Randy Shannon is taking over as the interim head coach for the Gators, which is good to see for Shannon. Shannon was previously the head coach at Miami, but could not get things going for the Hurricanes. However, he is well-liked and respected in the coaching game and now has an opportunity to guide Florida to a solid finish that results in a bowl trip. If the players in Gainesville won’t play for Shannon, that would be a shame. We’ll see where Florida goes from here, but the focus is already shifting to Tennessee and Butch Jones. It is already confusing how Tennessee has decided to hang on to Jones as long as they have, but there could be rumblings out of Knoxville fairly soon about the SEC’s next college football coaching change. Related stat: Alabama hired Nick Saban in 2007. There have been 37 different coaches at all other SEC programs during that span (including Texas A&M and Missouri after joining the conference), and each school has had at least one coaching change except for Texas A&M (Kevin Sumlin took over the same year the Aggies joined the SEC). In that period, Houston Nutt and Ed Orgeron have each had separate head coaching gigs at multiple SEC schools. First, it was Stanford running back Bryce Love and San Diego State running back Rashaad Penny giving east coasters a reason to stay up late watching college football. Now, Arizona quarterback Khalil Tate is getting in on the fun in a big way. After not beginning the season as the starting quarterback for the Wildcats, he has been on a tear since taking over against Colorado, and may have saved Rich Rodriguez as a result. Tate is second in the Pac-12 in plays of 30+ yards with 12, trailing only Stanford’s Love. He is one of five players in the conference with a play of 80+ yards and he is the only Pac-12 player with 4 plays of 70 yards or longer (Washington’s Dante Pettis is second in the Pac-12 with two). Tate has surged into the Heisman Trophy conversation as he leads Arizona into a key matchup in Pac-12 play this week against USC. Win this game and Tate could very well be building enough of a resume to get himself to New York City. The Heisman race is already pretty crowded at the moment, though, and I can’t help but think this late start to the season for him and playing his games as late as he is (USC-Arizona doesn’t kick until 10:45 p.m. ET this Saturday) will ultimately cost him a trip. All I know is I’m staying up and waiting for his next long touchdown run. I knew Iowa State made a good coaching hire when they hired Matt Campbell away from Toledo in 2015. Campbell had replaced Tim Beckman as the head coach after Beckman left to coach Illinois, and he continued to do good work at Toledo. I was there for his first game as interim coach in 2011 when he coached Toledo to a victory in the Military Bowl in 2011, and I wasn’t quite sure where Campbell was going at that point in time. He retained the job and coached Toledo to four straight winning seasons, including a victory in the GoDaddy Bowl in 2014 and a 9-2 record in 2015. With a 35-15 record as Toledo’s head coach, he was clearly ready for the next challenge at a power conference program, and he took on one of the biggest challenges of all at Iowa State. In his first season, Campbell had his first losing season when Iowa State went just 3-9 in 2016. It was expected. Iowa State had won no more than three games each of the three previous seasons and turning things around was not going to happen overnight. But he put together his game plan for building a successful program and as the 2017 season is demonstrating, his players are buying into it. Iowa State pulled off another upset in Big 12 play on Saturday with a home win against No. 4 TCU, dropping the Horned Frogs into the loss column for the first time all season. The win was a historic one as the Cyclones became the first team in over a decade to chop down two top 5 teams before flipping the calendar to November, as noted by Associated Press college football writer Ralph Russo. Iowa State is the first team to beat two AP top-five teams before Nov. 1 since Florida in 2005. The win at Oklahoma was a stunner, but the TCU victory is showing that maybe it should no longer be considered an upset. In a conference not really known for its defense, the Cyclones have the second-best defense and the second-best scoring defense, which is a far cry from the Iowa State of recent seasons. With head-to-head tiebreakers with Oklahoma and TCU, Campbell has Iowa State sitting at the top of the Big 12 standings going to November with a spot in the Big 12 championship game realistically coming into view. 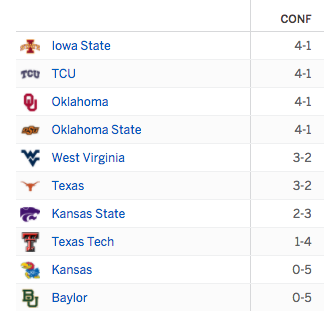 Big 12 standings as of Oct. 30, 2017. Iowa State probably has to go 3-1 in their final four games to get to the Big 12 championship game, and that is still a challenge for a growing program like Iowa State. Going no worse than 1-1 the next two weeks is essential with a road game at West Virginia this week and a home game against Oklahoma State next week. After that will be back-to-back road games at Baylor and Kansas State to wrap up the regular season. We’ll see if Iowa State can get the job done, but no matter what happens in the next four games, Campbell has proven worthy of some potential phone calls from schools looking for a head coach one way. He is the coach of the year in the Big 12 and a viable candidate for some national coach of the year consideration, along with UAB’s Bill Clark (UAB may be going bowling!) and UCF’s Scott Frost. South Florida took a loss at home over the weekend against Houston, knocking the Bulls from the ranks of the unbeaten teams in the nation. That means the Group of Five is down to just one unbeaten team this season: UCF. The Knights remain the top team in the entire Group of Five hunt right now, but it is not time to pencil them into a New Year’s Six bowl just yet. However, the AAC still looks to be in a pretty good spot compared to the Mountain West Conference, but do not lose sight on the MAC with Toledo still very much on the radar. Toledo has been taking care of business in MAC play with a third straight double-digit victory after a close call against Eastern Michigan. The Rockets have also scored wins against the Mountain West (Nevada) and AAC (Tulsa), but had a setback in their tipping point opportunity on the road against the Miami Hurricanes, losing 52-30. Had Toledo won that game or just played better to make it closer, Toledo would be a better spot than they sit right now. The Rockets have to avoid an upset this week at home against Northern Illinois in a game that will likely determine the MAC West Division. Toledo still has some hurdles to clear, but Logan Woodside and company are very much on the radar. However, they still need some shakeups in the AAC right now. Toledo, in my mind, is trailing UCF and Memphis, and South Florida is still likely to pass Toledo if the Bulls rebound and go on their own run. One team to keep another eye on? SMU. Chad Morris has the Mustangs going to a bowl game after a win against Tulsa. This week, SMU hosts unbeaten UCF in what could potentially be an AAC Championship Game preview if the Mustangs can get the win. SMU also has difficult road tests at Navy and Memphis after this week, but it has been fun to watch Morris improve SMU to the point where it is now going bowling. Expect Morris to be getting some phone calls about some potential job offers. Here is how I rank the top five Group of Five contenders as of today. After some significant results over the weekend, there is a bit of a shakeup in my latest College Football Playoff pecking order. This week, I’m switching up all four spots by bumping the Georgia Bulldogs into the top spot and dropping Penn State and TCU out to make room for some of their conference foes. Sorry ACC and Pac-12, but you are on the outside looking in this week. My logic here is simple. For starters, I think Alabama is going 13-0 with the SEC championship. As the only unbeaten team out there, the top seed is clearly Alabama’s in this projection. I also don’t think Ohio State or Penn State are going to lose another game, which means the Buckeyes will be 12-1 with the Big Ten championship and Penn State is going to be 11-1 with just a one-point road loss against what ends up being the No. 2 team in the ranking. I’m mildly buying into the idea Notre Dame avoids a loss, but I am not real comfortable with it. But right now, I can envision a path to 11-1 that would include victories over Miami and Stanford on top of what has already been achieved. So how do I get two 11-1 non-conference champs in the playoff? Auburn beats Georgia. Alabama beats Georgia in the SEC championship game, knocking the Bulldogs off the playoff radar. Stanford or USC as three-loss Pac-12 champion. No way either would get in with three losses considering the other options. Two-loss Big 12 champion. If it’s Oklahoma, that could be a real case to be the first two-loss team in the playoff, considering the win at Ohio State. But I think Oklahoma State upsets Oklahoma this weekend and we end up with a two-loss Big 12 champ looking in from the outside. NC State beating Clemson this weekend is essential. That puts the Wolfpack, with two losses, in the driver’s seat for an ACC championship game matchup against either Miami or Virginia Tech. I already have Miami losing to Notre Dame in this projection, and Virginia Tech might take down the Hurricanes as well. A one-loss Virginia Tech would be the only threat left for Notre Dame and Penn State here, but I’ll go with the Wolfpack in a close win to ensure mass chaos. Even if UCF is 13-0, I don’t think the selection committee would consider them a strong enough option for inclusion here. Certainly not ahead of any of my top three seeds, and I wouldn’t see Penn State with one loss being passed over for UCF either. Who doesn’t love a little chaos, right?